Ideas have varied when it comes to facing climate issues, from space solar panels to floating cities, there’s no shortage of futuristic visions. Nevertheless, the world is currently transitioning to a low carbon economy and the pace of change is increasing as more consumers and businesses adopt renewable energy solutions, and as more voices demand it. There have been concrete steps taken worldwide to try and help. The Paris Agreement for example, signed in 2016 by 174 countries and the EU, deals with greenhouse-gas-emissions mitigation, adaptation, and finance. An agreement which in 2017, the United States of America stated they wanted to leave. However, the process required to leave the agreement is quite a lengthy one and if the country decides to proceed with its decision, it won’t be leaving until November 2020. Renewable power sources have become commonplace around the globe. In 2017, hydro-power generated 16.4% of the world’s electricity, equivalent to enough electricity for 1 billion people. This prevented approximately 4 billion tonnes of greenhouse gases being emitted into the atmosphere. Brands are also taking notice, Unilever is aiming to become carbon positive by 2030 and wants to address change in plastic waste. Patagonia is widely known for using recycled fabrics, they also donate 1% of sales to the preservation and restoration of the natural environment. IKEA has invested $2 billion into renewable energy projects and is banning single-use plastics from its stores. The list goes on, but it’s big names like these that are needed to set an example and make a real impact. 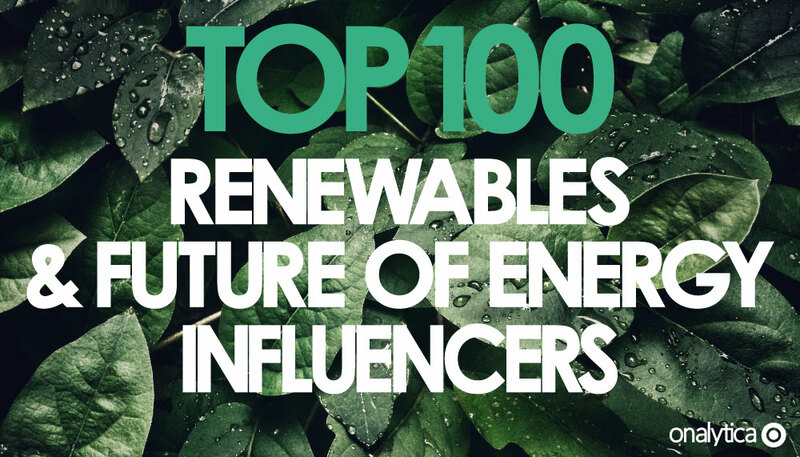 For this Top 100 we’ve concentrated on influencers within two highly important topics which tend to intertwine: renewables and the future of energy. 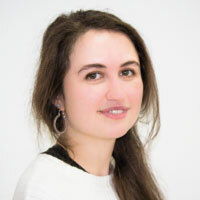 So using a comprehensive Boolean search query we analysed over 9 million posts mentioning all the keywords we identified, from 14th April 2018 to 14th April 2019. We then identified the top 100 most influential individuals leading the discussion on social media. Below you can see a network map of the online conversation around The Future of Energy. The top influencer Joe Kaeser is at the centre. This map was created using the Onalytica platform. 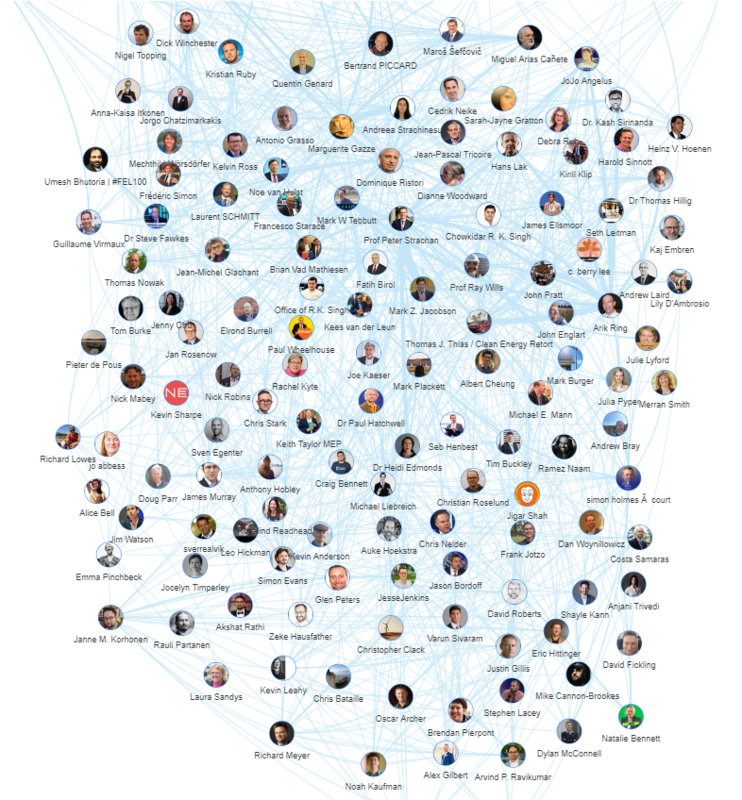 We looked at all the individuals engaging on Twitter to bring you a list of the top influencers in Renewables and Future of Energy. Below is the top 50, if you want to see who ranks from 50-100 be sure to download the full report by filling the form in below. Disclaimer: As ever with these lists, it must be stressed that the ranking is by no means a definitive measurement of influence, as there is no such thing. The brands, individuals and publications listed here are undoubtedly influential when it comes to driving discussion around renewables and future of energy. 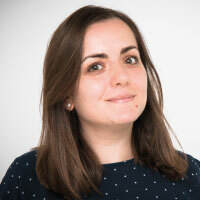 Onalytica’s PageRank based methodology is used to extract influencers on a particular topic and takes into account the number and quality of contextual references that a user receives – this allows us to identify Topical Authority (reference) – our priority influence metric. We analyzed topical authority via their social engagement on Twitter and how much influencers were referenced in association with renewables and future of energy on Instagram, Facebook, YouTube, Forums, Blogs, News and Tumblr content. These calculations also take into account a user’s resonance (topical engagement) relevance (number of posts on topic, and % relevance – the proportion of their social content on the topic) and reach (number of followers). If you want to learn more, please read our article that outlines How to identify your target influencers. Effective influencer marketing starts with identifying relevant influencers for your brand. Onalytica’s new Discovery platform mines over 200 billion posts a year into a curated database of over 700K global social media influencers, including data from Twitter, Blogs, Instagram, YouTube, Facebook, LinkedIn Profile Links + Demographic Data. Our software enables you to identify influencers by topic, demographic or content and includes real-time tracking and measurement reporting to scale your influencer relations.